At the 50th Anniversary of Martin Luther King Jr.'s March on Washington yesterday afternoon, former President Bill Clinton delivered not just one of the best lines of the day, but one of the best lines of the debate over voting rights when he declared, "A great democracy does not make it harder to vote than to buy an assault weapon." It exploded on Twitter, captured headlines and struck a chord on the left, distilling a complex problem into an accessible and emotionally charged little nugget. And on top of that, it tied together two disparate progressive policy goals. A perfect tidbit of political meme-making. And the most remarkable part about it: If you live in a growing number of states, it's absolutely true. In places like Texas and Virginia with strict voter ID laws and weak gun regulations, it's pretty safe to say that it is in fact easier to purchase an AR-15 than to vote for president. Nationally, well, that's another story. First, take a look at the voting laws. There are currently 13 states that have passed strict voter ID laws, according to Keesha Gaskins, senior counsel at the Brennan Center for Justice. (Some of those laws haven't gone into effect yet, or are facing legal challenges, but for the purposes of this exercise, we'll treat them as if they're in place.) These kinds of laws are the most restrictive type of voting legislation around. While federal law requires some kind of ID, it could be a utility bill, student ID or, in some cases, even a signed affidavit attesting to your identity, among other things. But in strict voter ID states, it has to be a government-issued photo ID, and some states, like Texas, don't even allow out-of-state IDs. These restrictions can be a big burden for millions of people who don't have driver's licenses or birth certificates, or who lost them, or who don't live near a DMV, etc. Individuals who buy guns from an unlicensed private seller in a “secondary market venue” (such as gun shows, flea markets, and Internet sites) are exempt from the requirements of federal law to show identification, complete the Form 4473, and undergo a National Instant Criminal Background Check System check. States can add their own restrictions on top of that, but only about a third have. "Under the law in 33 states, it is legal for a person to purchase any kind of assault weapon (assault rifle or assault pistol) without any kind of background check or even showing ID, so long as the seller is not licensed as a dealer," explained Lindsay Nichols, an attorney at the Law Center to Prevent Gun Violence, which tracks firearms regulations. And while it takes just a few seconds to complete a background check in more than 95 percent of cases, it can take hours of work and days of waiting for someone to acquire the ID they might need to vote. Scoreboard: There are 33 states where you can buy an assault weapon without ID, versus zero states where you can vote without providing some kind of ID -- it's federal law. Meanwhile, there are 43 state where you can buy an assault weapon with an ID, and, and 37 states were you can vote without a government-issued ID. But it's important to note that the kinds of states that tend to implement voter ID laws -- those controlled by Republicans -- are not the kinds of state that tend to implement gun restrictions, which is generally a Democratic thing. 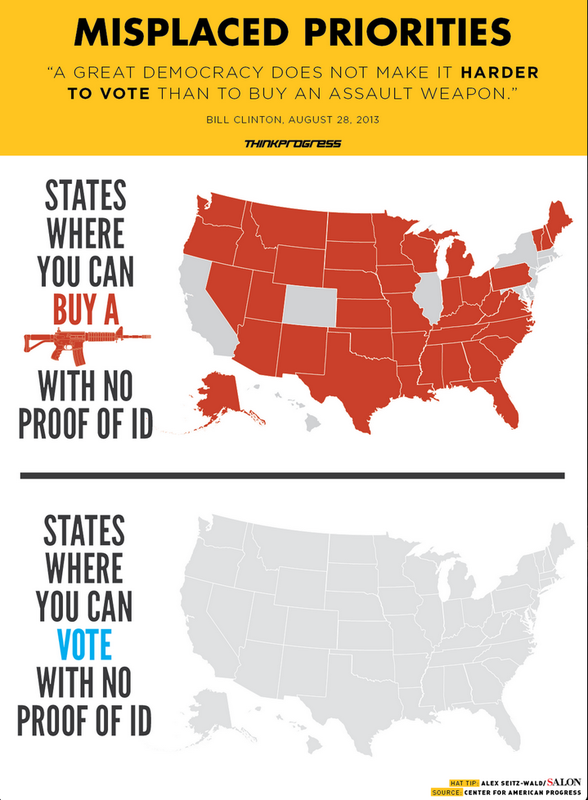 (For a visual aid, compare these two maps: guns, votes.) So, in states like Texas and Virginia, which have both recently enacted voter ID laws, it is safe to say that, once those laws go into effect, it will absolutely be easier to purchase an assault weapon than to vote. No ID required to buy the gun, a government-issued photo ID needed to vote. And while gun regulations are eroding or making modest progress in state capitols across the country, state legislatures are rushing to enact voter restrictions. "We're in the middle of the biggest wave of restriction of voting rights since the Voting Rights Act was passed in 1965," said Katherine Culliton-Gonzalez, the director of voter protection at the Advancement Project, a civil rights group that litigates against restrictive voting laws. At least 36 states have introduced restrictive voting laws this year alone, according to a report from the Lawyers’ Committee for Civil Rights and the Advancement Project, and at least 10 have passed them. Last year was just as bad and next year is expected to be even worse, since the Supreme Court repealed the Voting Rights Act and given that there's an election. "In the 2008 election, there were two states with strict voter ID laws, in 2012 there were four, by 2014, we'll have somewhere like 14," Gaskins said. "These aren't just growing, they're growing exponentially." Voting and firearm ownership are both fundamental American rights, but there are a few huge, critical differences here that should perhaps influence the way the state regulates them. Just to name a few: 1) There's little danger of someone killing someone with their voting card. 2) There's plenty of evidence that people die from guns, a crisis that might naturally provoke a public policy response, while there is essentially zero credible evidence of voter fraud, the perorated reason for enacting ballot restrictions. And 3) perhaps most important, as Gaskins noted, "If you really want a gun, there will always be a way to find one easily, either at a gun show on the streets. But in some states, there is no easy way to vote."